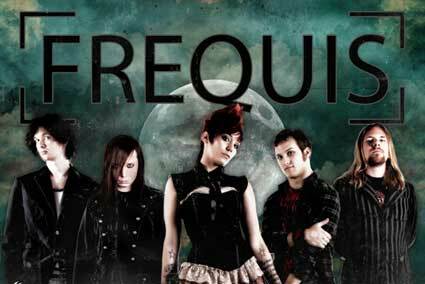 Frequis is a five piece rock band from Phoenix, AZ. Their dark and sludgy sounds are reminiscent of grunge, metal and progressive rock. Frequis is defined by a powerful voice, a relentlessly driving rhythm section, dynamic guitar solos, and high octane live performances. Frequis has influences ranging from 90's grunge such as Alice and Chains, Soundgarden and Faith No More to more progressive bands such as Dream Theater and Pink Floyd. The result is a bold new sound unlike anything you have heard before: dynamic songwriting containing soulful yet catchy melodies while still maintaing the fierceness and power of metal. Providing the fresh new face and voice to the band is singer/lyricist Cassie Aguiar, who fuses her operatically refined vocal prowess with a surge of post-metal screaming to command and captivate her audiences. The sound is complemented by the melodic, bluesy, yet tastefully technical lead guitar work of Chris Nastri. Brian Morris completes the Frequis sound with his clean, responsive playing and excellent sense of music and progression. Jared Johnson adds exciting melodic bass lines that bring skillful bass playing back to rock music, and underneath it all is Pete Czapiga's creative drum style which combines technical progressive drum beats with tribal melodic rhythms. Frequis hopes to bring creativity and risk back to the stale commercial rock scene that still lingers on. Frequis released their self-titled EP in July 2011, produced by the legendary Jim Wirt. Currently, Frequis is taking over the Phoenix music scene and touring the southwest. Frequis remains an independent unsigned band, funding their own recordings, marketing and tours, until the right label presents itself. Frequis hopes to record their next full length CD with Jim Wirt in the summer of 2012.